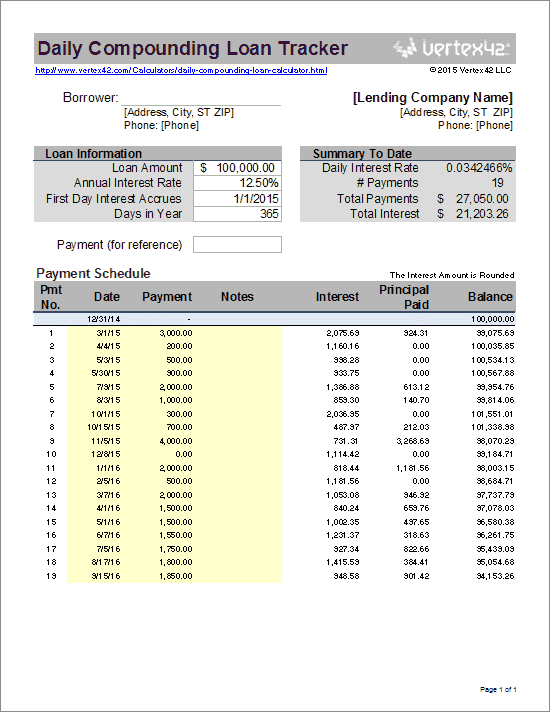 Download a spreadsheet for analyzing and tracking a Daily Compounding Loan. This calculator is based on our simple interest loan calculator, which accrues interest on a daily basis and allows you to track your payments by entering the actual dates and amounts paid. However, in the daily compounding calculator, interest compounds daily AND unpaid interest is added to the principal balance (like a credit card). Important: Unless you are absolutely sure that you have a daily compounding loan, do not use this spreadsheet. Vertex42 provides many different loan calculators, but they are all designed for specific types of loans and it is important that you don't use the incorrect one. This spreadsheet includes two different worksheets. 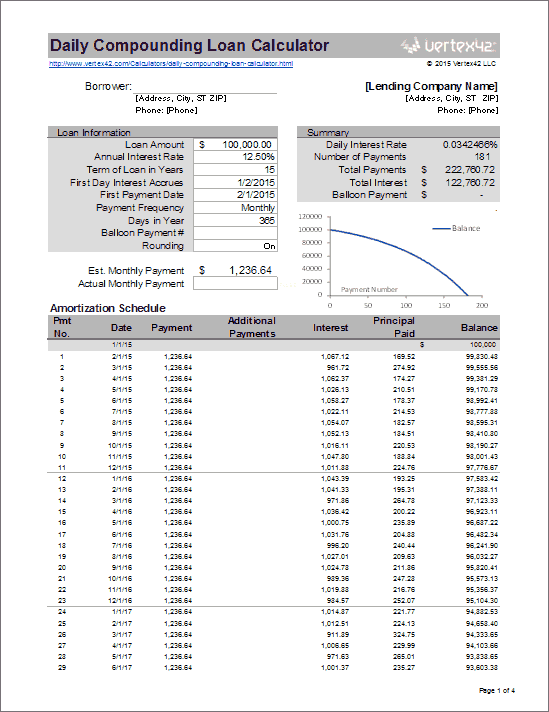 The first one lets you create an estimated amortization schedule for a daily compounding loan, with assumptions such as payment frequency, interest rates, etc. The second worksheet shown in the image to the right lets you enter actual payment dates and amounts. The interest is calculated based on the dates you enter (using a daily compounding formula). To see how daily compounding works, you can enter a row for every day. This will show that interest is being added to the principal every day. If your credit card charges interest based on daily compounding (or using an average daily balance), then this spreadsheet may provide a way to analyze and track your credit card. Add new purchases by entering negative values into the Payment column. Enter a date with a zero payment to calculate the balance on a specific date (such as your credit card statement date). 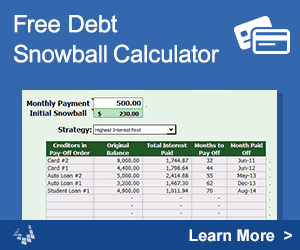 Online Loan Calculator at pine-grove.com - This calculator has an option for daily compounding. From what I can tell, it assumes a 360-day year and the date you enter for the Loan Date is one day prior to what you would enter as the "First Day Interest Accrues" in the above spreadsheet. Negative Amortization at Vertex42.com - Read this article if you are planning to use the above spreadsheet. Negative amortization (paying interest on interest) applies here because the compound period (daily) is shorter than the payment period (monthly). Disclaimer: The information and content on this page is for educational purposes only. We do not guarantee the results or the applicability to your unique financial situation. You may need to seek the advice of qualified professionals regarding financial decisions.